i've begun to wonder about the resurgence of interest in art nouveau in the 1960s; there aren't easy answers because, as it turns out, the questions aren't easy! i had read somewhere that a collector with a huge collection of art nouveau treasures which had become all but worthless arranged for a museum exhibition, thus reviving value in what he owned. but even if i could find that reference again, which i have not, i am beginning to think it's apocryphal anyway: it's a story with as many roots as did the original movement itself, and i hope i can untangle some of them. to give you an idea of what i mean, let's take rock posters, for a start. seeing them juxtaposed like this with those from 60 years earlier, it's almost hard to tell which are more "psychedelic," but the influence is obvious. but! what do we mean when we say influence? style? lettering? direct theft? over the next number of posts we'll look at all of these, as well as the many others that arise. as usual, i'm learning as i go along, hoping to assimilate. i have books coming from the library, letters i've written to the artists themselves, etc. and of course rock posters is just the beginning. what about that mucha poster you had on your wall in 1969? wow, that's so fascinating, again, I had no idea about it, I'm very curious! thanks roxy! i was one of those people in the 60s; i remember coming across a set of match-boxes in a gift store with aubrey beardsley images on them and i'm like..... whoa!!! until that day, nothing i'd ever seen looked anything like that. then when the mucha posters started showing up--heck when poster stores started showing up.... i was solidly hooked. it just never occurred to me to wonder how it all came about. Oh, yes! Fun, indeed! 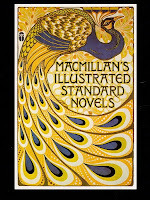 I was a huge fan of art nouveau in the early seventies. I am looking forward to more. I look forward to read more ! Thank you so much for asking, roland. when most images here are clicked on you see the artist's name at the top of the window. turns out, though, that somehow i'd mislabeled this one. turns out it's by heinrich vogeler. i could only find a small part of it bigger here. 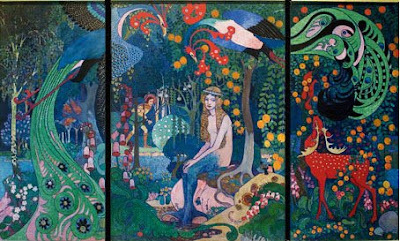 it's part of a triptych of which the online german magazine says (through a translator) "(the) Heinrich Vogeler triptych shows the beautiful nymph Melusine in a magical landscape. This key work of Art Nouveau is one of the major works that we have in the past few months helped acquire. It will be held alternately in the National Museum for Art and Cultural History of Oldenburg and in the Worpswede Barkenhoff Foundation to be seen." the original i downloaded seems no longer to be online, but i ran it as big as i got. but you can see it in context here. I love the Heinrich Vogeler piece. I went and looked him up...saw a bunch more. Thanks for turning me on to him.